Your life is “always on”: Shouldn’t your truck be, too? The all-new 2016 Toyota Tacoma is the compact sports pick-up that’s always on for adventure. With fresh styling, upgraded performance, segment-leading features and Toyota’s reputation for engineering trucks that dominate any terrain or climate, the 2016 Tacoma is ready to dominate dirt, rocks or pavement, 24/7. The new Tacoma represents tremendous choice, so Canadian truck-buyers can choose their perfect partner for fun and adventure. And with eight models, truck fans have a range of choices – two engine sizes, three transmissions, two drive trains, two cab configurations, two cargo bed lengths and twelve trim levels. For the new Tacoma, Toyota engineers created an all-new, segment-first 3.5L Atkinson cycle V6 equipped with Toyota’s D-4S technology, featuring both direct and port fuel injection. This engine develops a peak 278hp and up to 265lb-ft of torque, and is available on five models. The Tacoma is also available with the proven, powerful and efficient 2.7L four-cylinder. This engine generates a peak 159hp, up to 180lb-ft of torque, and impressive fuel efficiency. Both engines are standard equipped with a heavy-duty battery, starter, alternator and heater, plus a stainless steel exhaust system – for worry-free starting on cold mornings and protection against the ravages of winter. The 4×2 drivetrain boosts fuel efficiency while offering impressive towing capacity. The on-demand 4×4 drivetrain delivers superior traction and performance under all weather and terrain conditions. 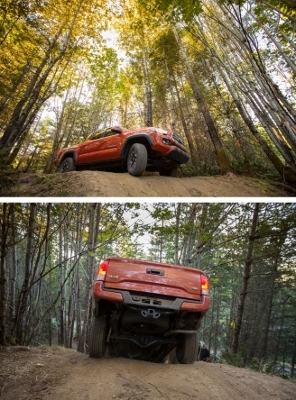 4×4 Tacoma models feature an available Auto Limited-Slip Rear Differential, two-speed transfer case, automatic disconnecting differential, and One-Touch 4WD to seamlessly switch into and out of 4WD mode. Pick the cab size that suits your needs and desired levels of comfort. The Tacoma Access Cab has room for four, and Double Cab can seat up to five people. Got gear? Tacoma’s great with that! With five-foot and six-foot bed lengths, depending on the model, plus a payload of up to 1,620lbs the Tacoma is equipped to handle all of your work or adventure gear. And if it doesn’t fit in the bed, the new Tacoma can tow up to 6,500lbs, depending on model. Many models also come factory equipped with a Class IV towing hitch and trailer wiring harness – so you’re good to go. Tacoma is ready for all of your off-roading adventures, yet is unexpectedly civil on the pavement too. The front suspension is a double-wishbone independent design with stabilizer bars, while a leaf spring suspension supports the rear. Powerful brakes with front ventilated disks and rear drums will bring you to a safe stop, assisted by active safety technologies as part of the Toyota Star Safety System. All Tacoma models are generously equipped with standard comfort, convenience and safety features that raise the bar in the compact pick-up truck segment. New features standard for all 2016 models include: Toyota’s latest Display Audio system, a new multi-information display with integrated outside temperature gauge, door scuff plates, fog lamps, power-adjustable heated exterior mirrors, and a new reinforced locking and removable tailgate with Easy Lower function to highlight a few. Tacoma is also the first in its class to offer dual-zone automatic climate control, on select models. In addition, the 2016 Tacoma becomes the first model in the segment to be factory equipped with a GoPro® camera mount on all models. Located near the rear view mirror, this mount allows any Tacoma owner with a GoPro® camera to capture every moment of their adventure. Additional standard features on all models include but are not limited to power door locks with keyless entry, power windows, sliding rear window, cruise control, tachometer, two 12-volt DC accessory connectors, aluminum alloy wheels, rear step bumpers, double wall composite cargo beds with tie-downs and cleats, halogen headlamps, and variable intermittent wipers. Available premium features include: the Qi wireless charging system, a power moonroof, Toyota’s Smart Key with Push Button Start, and premium leather seats. While there’s lots that’s new about the new Tacoma, one thing has remained; Toyota’s commitment to earning the segment-leading customer loyalty rating by crafting quality vehicles that are durable, reliable and safe. As with all Toyota trucks, safety comes standard with Toyota’s Star Safety System which includes Antilock Brake System, Brake Assist, Electronic Brake-force Distribution, Vehicle Stability Control, Active Traction Control and Smart Stop Technology. These six active technologies work together to help drivers avoid potential accident situations. All Tacoma models are fitted with class-leading 8 airbags. This model features the powerful and efficient 2.7L four-cylinder engine, a six-speed Super ECT automatic transmission, a six-foot cargo bed, plus an impressive list of standard features including six speakers, 6.1” Display Audio System with Voice Recognition, leather-wrapped steering wheel with tilt/telescopic steering column, driver’s side window auto-down function, fold-up rear seats, 16” alloy wheels, and more. This model features the 2.7L four-cylinder engine, a five-speed manual transmission, a six-foot cargo bed, plus a well-appointed list of standard equipment. These include: six speakers, 6.1” Display Audio System with Voice Recognition, backup camera, a tilting/telescopic steering column with mounted audio controls, fold-up rear seats, and 16” alloy wheels. This model features the 2.7L four-cylinder engine, a six-speed automatic Super ECT transmission, a six-foot cargo bed, plus additional standard equipment including a 6.1” deluxe Display Audio System with Advanced Voice Recognition, integrated XM Satellite Radio, leather-wrapped steering wheel, SR5 grade fabric seats, 4.2” multi-information display, 16” SR5 alloy wheels, rear privacy glass, chrome rear bumper ends, colour-keyed fender flares and mirrors; plus more. This model features the new 3.5L Atkinson-cycle V6, a six-speed manual transmission, electronic throttle control system with intelligence, a six-foot cargo bed, Bilstein shock absorbers, and all-terrain tires. Building on the Access Cab, the TRD OFF-ROAD adds a 7” premium Display Audio System, Navigation system, dual-zone automatic climate control, leather-wrapped shift knob, heated front sport seats, TRD grade fabric seats, auto-dimming rear view mirror with compass, power windows with driver and front passenger auto up/down, integrated garage door opener, anti-theft system, unique mesh grille, TRD decals, Class IV trailer hitch with 7-pin trailer wiring harness, 400-watt power outlet in cargo bed, LED daytime running lights, mirror integrated signal lamps, front skid plate, 16” TRD OFF-ROAD alloy wheels, splash guards, and black fender flares. Complete with the 3.5L Atkinson-cycle V6 engine this SR5 V6 model also builds on the Access Cab model adding an auto-dimming rear view mirror with compass, leather-wrapped shift knob, Class IV trailer hitch with 7-pin trailer wiring harness, and a 400-watt power outlet in cargo bed. Equipped with the new 3.5L Atkinson-cycle V6 and a five-foot cargo bed. Building on the TRD OFF-ROAD Access Cab model, this model adds 60/40 split folding rear seats with fold-out seat cushion, 17” alloy wheels, colour-keyed rear bumper ends and fender flares, front air dam, and hood scoop, in addition to seating for five. Running on the new 3.5L Atkinson-cycle V6, This model includes: six speakers, a 6.1” deluxe Display Audio System with Advanced Voice Recognition, integrated XM Satellite Radio, 60/40 split folding rear seats with fold-out seat cushion, SR5 grade seat fabric, 16” SR5 alloy wheels, Class IV trailer hitch with 7-pin trailer wiring harness, and more. This top-tier model features the new 3.5L Atkinson-cycle V6 engine, a six-foot cargo bed, plus a wealth of standard equipment. These include Premium JBL Display Audio system with seven speakers, Navigation, advanced voice recognition, dual-zone automatic climate control, heated front sport seats, premium leather seating, Smart Key System with Push Button Start, Blind Spot Monitor with Rear Cross Traffic Alert System, clearance and back-up sensors, Qi wireless charging system, power moonroof, unique exterior details, LED daytime running lights, front air dam, 17” alloy wheels, mirror integrated signal lamps, Class IV trailer hitch with 7-pin trailer wiring harness, chrome side step bars, and exterior chrome accents. The 2016 Toyota Tacoma is the smart and tough truck that’s designed, engineered and assembled in North America – is backed by 50 years of proven capability and a legendary off-road racing heritage. It’s the compact pickup that’s ready to tackle almost any challenge, making it the perfect truck for Canadians that are hungry for adventure. The 2016 Toyota Tacoma will be on sale at Toyota Dealers across Canada this fall. This article has been imitated from Toyota Canada’s News Room. See the original article here. Every effort has been made to ensure the product specifications, equipment, and content on this site are accurate based on information available at time of publishing. In some cases, certain changes in standard equipment or options may occur, which may not be reflected online. Toyota Canada and Gander Toyota reserves the rights to make these changes without notice or obligation.